← Know what season we are entering? Are you prepared for Tornado Season? Severe thunderstorms rolled through Southeast Michigan this past Saturday leaving many residents without power. Also, their homes damaged by the 60mph winds, 2-inch hail, and fallen trees. Accordingly, DTE spokesman Alejandro Bodipo – Member, said Wayne County was the hardest hit. In addition, an estimated 50,000 customers and Macomb and Oakland with an estimated 10,000 customers each that lost power over the holiday weekend. 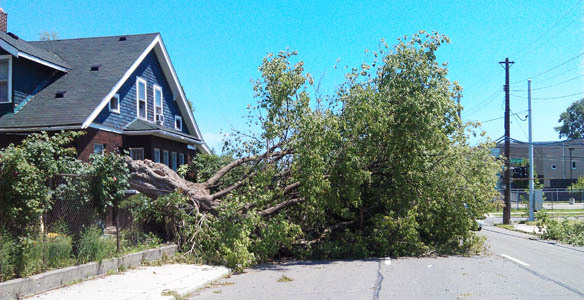 Storms – Furthermore, Homes damaged by the recent storm, contact your insurance agent to begin the repair process. Also, depending upon the extent and type of harm to your property. A board up may be necessary to secure your property to prevent further damage. Including damage from vandalism, theft, trespassers and the elements. Most noteworthy, Disaster Recovery teams are available 24 hours a day, seven days a week. 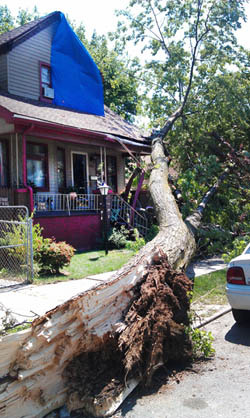 The team will arrive on-site for any storm damage typically within 1 hour to assess repairs. Rapid Recovery Service will work with all insurance carriers to help restore your property following storm disasters. Finally, contact Rapid Recovery Service for all and any emergency repair work including board-ups, the wind, and hail damage – 1-888-778-3337.